Rosalind Parker holds a London Arts and Humanities Scholarship to complete her doctorate in “Religion in the public sphere, as mediated through the arts” at Kings College, London. As a freelance curator, she works to engage audiences across cultural and religious demographics. As a theatre practitioner, Parker was an artistic director for Ulfah Arts and Media, a Muslim women’s social enterprise. Parker is also a founding board member of the European Network on Religion and Belief. Can the art museum become a site of cultural activity that can lend itself to the fostering of ritual experience? Following Carol Duncan, who writes of the “totality of the museum as a stage setting that prompts visitors to enact a performance,” I am going to focus on the British Museum’s exhibition Hajj: Journey to the Heart of Islam (2012), using it as a case study to open up how exhibition spaces can offer intersecting ritual experiences, both for people who self-identify as belonging to a particular religion—in this case Islam—and people who do not. The framing of the Hajj exhibition was very distinctive for British Museum standards, and it surpassed a lot of its usual expectations. Right across the board—from the British Museum’s public relations campaign, audience data collection, journalism, and social media—the Hajj exhibition was cast as taking its audiences on an “experiential journey” which was linked to pilgrimage generally, and the Hajj specifically. Yet it played on different associations and practices for different audiences, and had to navigate a complex web of educational, spiritual, and cultural trajectories. I want to explore whether it is possible to say that this exhibition transposed an element of the pilgrimage of the Hajj into the museum setting, whether it facilitated some shared experience which could be experienced by Muslims and non-Muslims, and whether it could be enjoyed by both of these audiences at the same time in a shared space but managed in such a way as to navigate their very different expectations without diminishing religious differences, or de-sacralizing it as “only” a cultural excursion. Taking the Hajj exhibition as my case study, I want to talk about two things: firstly, that audiences responded to the exhibition as evocative of spiritual experience generally, and of the Hajj experience specifically, across an almost even 50/50 breakdown between Muslims and non-Muslim visitors. Secondly, I want to look at how Muslims as well as non-Muslims experienced the space and what specifically the exhibition setting had to do with that. This exhibition was the last in a series of three that Neil McGregor, the director of the British Museum, commissioned on spiritual journeys. First came the exhibit, “The Book of the Dead,” which ran from November 2010 through March 2011, and invited its audience to follow the ancient Egyptian’s journey from death to the afterlife through papyrus scrolls and linens dating back 3,500 years. Next came the “Treasures of Heaven” exhibition, running from June to October 2011, which brought together 150 medieval relics collected from the Vatican, European churches, and museums all over the world. And last came the Hajj exhibition, “Journey to the Heart of Islam,” which ran from January to April 2012. The exhibition was organized into three main sections: the preparation for Hajj; the journey, reaching the heart of Islam; and, finally, what it means to be a hajji. From my research, which has involved looking at press and social media, interviews with the curators, descriptive analysis of the visitors’ feedback, and at the way that the British Museum’s public relations campaign was structured and presented, I think it is possible to frame the “performance” of visitors to the exhibition in several, and I would say unusual, ways. Firstly, the exhibition was characterized as an immersive experience, with audiences displaying a heightened awarenessness of their surroundings, commenting on the “atmosphere” of the space, and remarking about the way that the space had been handled. Secondly, this experience was framed as a narrative, as the telling of a human story. And following from this, the exhibition was described as a journey, in some way similar to, or resonant of, a pilgrimage. 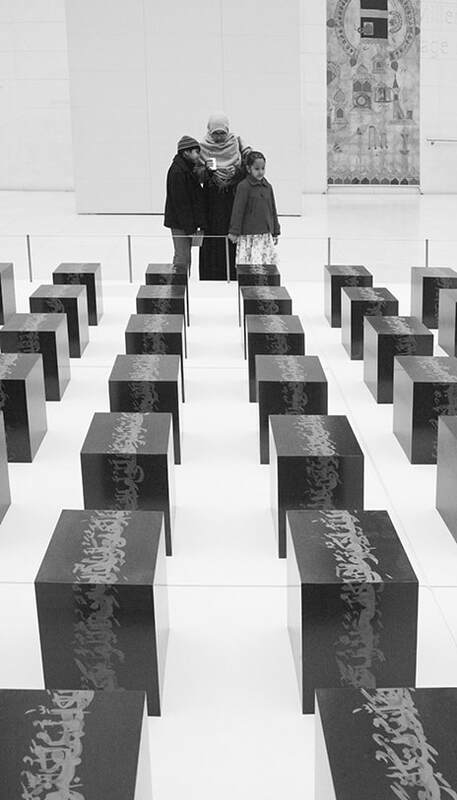 The film was the explanatory component of the exhibition, enlightening those who had not been on Hajj (i.e., many of the Muslim audience, as well as most, if not all, of the non-Muslim); it is therefore notable that the curators chose to place it halfway through a visitor’s journey through the reading room. In the Pompeii exhibition, by contrast, the explanatory video was the first thing the viewers met when they entered the reading room. Venetia Porter, one of the two curators behind the exhibit, said that she found “conveying the spiritual aspect of the journey” one of the most exciting parts of the project. Most visitor feedback was voiced in experiential rather than didactic language. In comparison to other British Museum reports, visitors were less likely to express their reactions in terms of what they had learned, and more by how they had felt. The report states that both Muslim and non-Muslim visitors experienced high levels of “emotional and spiritual outcomes.” This phrase obviously requires a lot of unpacking. For the purposes of this article, however, I am not going to examine whether and in what ways the visitors were having, or might have been having, “spiritual experiences” in the space. Rather, I am interested in exploring the fact that people described their experience as spiritual, given that the subject matter was the Hajj, and that the audience was only half Muslim. Beyond creating an immersive space for the viewer to enter, curators designed the space with an explicit reference to the idea of a journey, or progression. The spiral route which the exhibition path took, going deeper and deeper into the reading room, echoes the circling of the ka’aba in Mecca—the traffic through the exhibition physically picking up the centripetal flow of the pilgrims around the black stone. Viewers commented on the increased light as they walked through the space. To quote from one Muslim vox pop, “it gets lighter and lighter and lighter, which I think is really good because by the end you understand more.” This is an apt description of how the space shaped this visitor’s epistemological journey through the subject of the Hajj, literally by use of light. The British Museum’s exhibitions are generally built out of objects with accompanying wall-type to describe the objects visitors see. Although the Hajj exhibition included 180 objects, the curators said they found it difficult for these objects to tell a story by themselves. Venetia Porter said, “With an exhibition as extensive as this, you do not need more than 180 objects, but each one must tell a story—it must serve as a springboard for the visitor, taking him or her in a particular direction. The exhibit must work as a jigsaw, the pieces coming together in order to tell a story, with a spiritual aspect.” So, as the exhibition developed, unusual choices were made. There was increased use of audio, as well as documentary-style video footage of pilgrims on the Hajj. While audio and video are frequently present in exhibition collections at the British Museum, it is extremely rare to find them equally weighted with the artifacts, as they were here. The objects were continually woven into personal testimony. 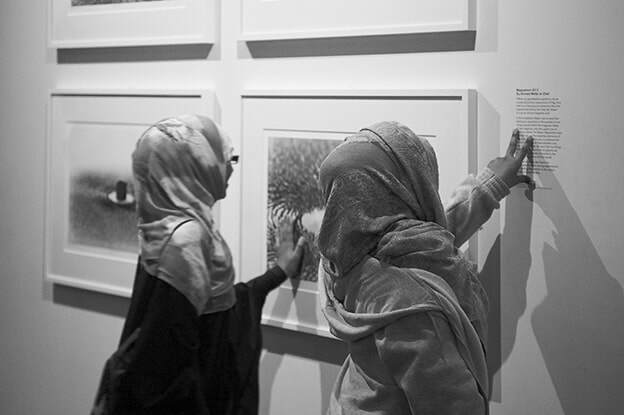 What Porter calls the “spiritual aspect” of the exhibit, she then links to the importance of conveying the Hajj in terms of personal narrative and testimony—both through videos of hajjis speaking about their own experiences, and through contemporary artistic responses to the Hajj. Ahmed Mater’s (b. 1979) Magnetism received a huge amount of attention, from public and press alike. It was a strong piece which dominated the room it was in. Audiences said they found it very moving. 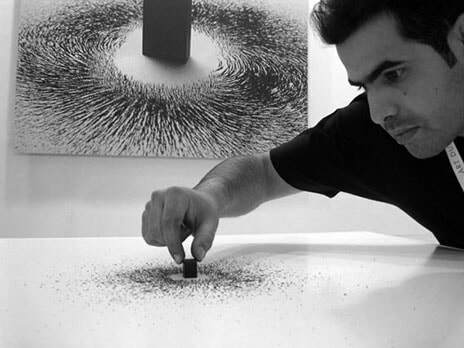 Magnetism is a sculpture made out of iron filings around a magnetic cube, which was physically present in one configuration, but behind which also hung accompanying panels with photos of the piece where the fillings were in different dynamic relationships with the central magnetic cube. These were juxtaposed with real photos of the crowds circling the ka’aba at Mecca. Ahmed Mater installs Magnetism. Courtesy of the British Museum, London. Used with permission of the artist. This piece demonstrates how contemporary creative responses to the Hajj were placed in conversation with archeological artifacts and modern photos, all with the curatorial intention that the “spiritual aspect” of the Hajj would come across better as in a jigsaw, where the different pieces come together to build a whole. Let us compare this approach to the earlier exhibition, “Treasures of Heaven,” which also reported strong “spiritual’ outcomes.” The kind of spiritual experience that visitors described after visiting that exhibit was quite different those reported after visiting the Hajj exhibition. Reaction to “Treasures of Heaven” was tied directly to the objects in the exhibition. Visitors characterized the objects as mediating the “spiritual” dimension of their visit, and so offering a different kind of apprehension of sanctity. This was also almost exclusively limited to Christian visitors, linked to a cherishing of the icon, the physical object carrying or embodying spiritual significance. The reported testimonies from visitors of the Hajj exhibition did not describe the religiosity of their experience in this way, with only one exception regarding the initial impact of the entrance to the exhibit. Here, a single cabinet displayed one of the oldest known copies of the Qur’an, from the 8th century, borrowed from the British Library. This was illuminated by a single light source in an otherwise low-lit entrance hall, while the adhan, or call to prayer, was played from concealed soundcones (installed in a tapestry that one visitor described as a “backdrop” to the display). This curatorial decision had an overall effect which intentionally propelled the visitors into their journey through a kind of “sacred portico.” In other words, in entering the exhibition through this space, visitors were crossing a threshold. Despite this exception, the Hajj exhibit elicted responses from Muslim and non-Muslim audiences suggesting that the exhibition was an environment that gave permission for nostalgic or imaginative engagement with the Hajj experience, rather than a religious experience mediated through the specific objects on display, per se. In saying this, I am aware of the potential for the exhibit to idealize the Hajj in ways that could distort its theology. In fact, although the exhibition was generally well received, one of the most common criticisms from Muslim visitors was that the exhibition failed to convey any of the hardships of the Hajj—and it is a real danger. People do die. In 2006, there were 600 casualties among the pilgrims. The curators said they were trying to convey Hajj as first and foremost a story of people—a narrative element which allowed the historical journey of the Hajj to intersect with what is going on now. And this was unusual for the British Museum—to weave historical with the contemporary. But the mingling of historical with present-day imagery was accomplished not just by relating the past to the contemporary reality of pilgrims in Mecca, but by lacing these into the experiences the visitors were having in the exhibition space. If we have so far described an exhibition where visitors framed their visit in terms of immersive experience, of narrative journey, and even of pilgrimage—who were these visitors? In terms of demographics, numbers, and behaviors of the audience, in every way, this exhibition was atypical for the British Museum. Of the visitors to the Hajj exhibit, 47% were Muslims. Of these, 40% were Asian visitors. This is compared with only 8% of Asian visitors to the British Museum in general during that period. And just to put this in a wider context, in the 2010-2011 database of British Museum visitors, only 3% were recorded as identifying as Muslim. So we are looking at a jump of 3 to 47%. That is quite a leap. From its opening, the exhibition was crowded, receiving 80,000 visitors in just over seven weeks, and selling out so rapidly that the Museum extended its hours to Saturday and Sunday evenings. Many visitors commented on the large numbers of people and accompanying levels of noise. Where commented on, this was mainly expressed positively—indicating that the numbers “added to the experience,” by “giving . . . a sense of togetherness and shared experience.” This quote was from a non-Muslim focus group. Many people commented on the noise. There were speakers installed in the space: “soundcones” embedded in the display that played various sound-bites including the call to prayer and crowd sounds from footage of people on the Hajj. Visitor chatter was amplified by, or rather melded into, the sound of pilgrims in Mecca. Given the sheer volume of people in the reading room, it may also be relevant to consider that there were a high number of first-time visitors to the British Museum, as many as 25% had never visited the Museum before. There was also a high rise in family and group visits, with 36% visitors coming as family groups (compared to 5% at “Treasures of Heaven,” and 7% at “Book of the Dead”). Moreover, 18% of the visitors were under 16 years of age (compared to 4% at “Treasures of Heaven,” and 8% at “Book of the Dead”). In other words: it was a dynamic space. This dynamism served a crucial function. Not only did it encourage a direct link with the dynamism of the crowds circling the ka’aba, as the space physically and aurally reinforced the movement and purpose of pilgrims on the Hajj—which the display showed, as it also made visitors aware, even at the time of their visit, of their own experience of being in the museum. This is a conclusion from both the theatrical language which the visitors used to describe their visit and the reality that so many were drawn to comment on how the components of the space affected their experience. The lighting and sound had as much of an effect on what the viewers wanted to talk about in focus groups as many of the objects on display. In the way that viewers inhabited the space, they became an audience allowed, and even encouraged, to be self-reflective, and aware of each other—without that diminishing from their engagement with the subject of the Hajj. The dynamism and noise were not distractions; they enhanced the experience just as the crowd enhances the experience of the actual Hajj. How is this reporting affected by visitor breakdown between Muslim and non-Muslim visitors? The British Museum’s report states—and I think this is particularly interesting—that Muslim visitors were in many ways distinct from their non-Muslim counterparts, but despite their different profile and motivations, they had equally fulfilling experiences.” Obviously, the phrase “equally fulfilling” once again requires qualification, but for the visitor’s report even to state this is of note. Could it be possible, then, to say that, as the Hajj ritual was translated into a museum space, the way in which this dislocation was handled opened the experience to non-Muslims without desacralizing the Islamic aspect of the Hajj to self-identifying Muslim visitors? I am not proposing a leveling out, whereby Muslims and non-Muslims felt that they were having the same experience, or that they did not notice any differentiation. In what I described earlier as a “heightened awareness of fellow visitors,” many Muslims commented on the fact that the non-Muslim presence enhanced their experience, and vice versa. So we have an acknowledgement of religious difference which did not diminish audience experience. That same experience, which 81% of visitors qualified in “emotional/spiritual” terms, was then linked to pilgrimage in general and, for some, to the Hajj experience in particular. Thus, it seems that it can be said that the exhibit “opened out” the subject of the Hajj in a museum space. But what specifically does the museum setting have to do with all of this? To quote Neil MacGregor, Director of the British Museum, “This exhibition will enable a global audience to deepen their understanding of the significance and history of the Hajj. In particular, it will allow non-Muslims to explore the one aspect of Islamic practice and faith which they are not able to witness.” So he wanted to offer viewers the chance to witness something that they could not see elsewhere. Marlyn Greene, the Intercultural Community Program Manager for the Victoria & Albert Museum says that a huge part of her role is to “encourage communities to take ownership” of the space. The idea of “ownership” is an interesting one to bring in here. How does that apply to our case study? As the “Temple of the Enlightenment,” does the British Museum offer “a journey to the heart of Islam” that is liberated from the terms of a guest-host relationship more typical of the space? I do not think the exhibition space offered a blank canvas for its visitors. The notion of ownership is complicated. I personally visited the exhibition twice, once by myself, and once as part of a field-trip with a Muslim women’s group, where I was the only non-Muslim. On reflection, and in light of Marlyn Greene’s comment on “community ownership,” I would say that my experience was not entirely free of guest-host dynamic, an experience that would involve a “neutral shared” space rather than a space that “belonged” to one but not to the other. Rather, in my own experience, that guest/host aspect was present, but it sort of operated simultaneously, and was mutually reciprocated. Mine was not a totally common experience perhaps, but a balanced one. The subject was a “journey to the heart of Islam,” and I was the only non-Muslim in my group. However, as a regular British Museum visitor, I was aware of being more comfortable with the structure and implicit codes of behavior in the space than were many of my colleagues. Therefore, I do feel that in some sense I was on familiar ground and aware of hosting my “guests,” even as, given the subject matter, in another way, I was the guest of my hosts. 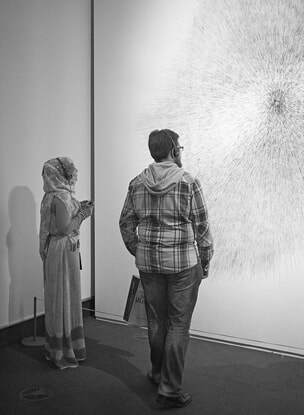 With the unusually high number of Muslim visitors, and their visibility, the audiences were aware that they were sharing something which they would not normally expect to be sharing. In closing, I would like to nuance the binary that I set up at the beginning between the experiential, on the one hand, and the instructive, on the other. On deeper investigation, perhaps what we are looking at is less of an either/or and more of a both/and. Did the museum context bring any expectations: of instruction, of attention to objects, of being solitary—expectations that provoked the audience to frame their reactions to the exhibition in terms expressive of learning? And did the subject matter bring any expectations: of an experience of the Hajj, of pilgrimage, of a religious experience that prompted audiences to frame their reactions to the exhibit in particularly experiential terms? The British Museum reports that “Muslim visitors described leaving the exhibition being more proud of their faith, and non-Muslims described now having the ability and confidence to discuss Islam with others.” Knowledge was mediated through the experience of being in the space together. Perhaps the curators decided that instruction might be more successfully achieved if learning took a more surprising route.